Purchased with the assistance of funds from the bequest of Hugh Phillips, Esq. 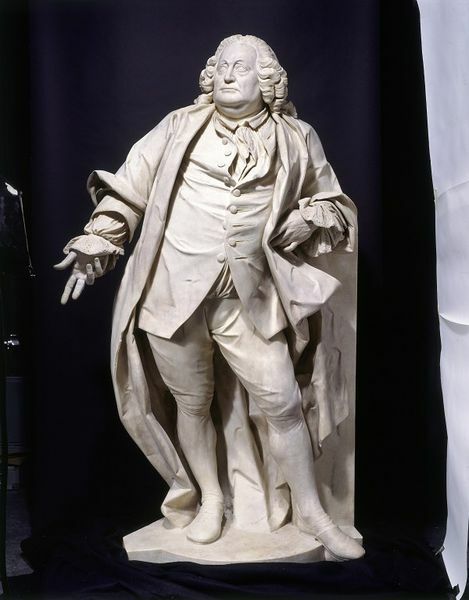 This figure of the celebrated quack doctor Joshua Ward (1686–1761) may have been intended for a monument in Westminster Abbey, which in the event was never erected. Joshua Ward made his fortune from popular patent medicines, known as Ward’s Drop and Pill, and counted among his patients George II, Lord Chesterfield and Henry Fielding. He was also a renowned philanthropist, and opened two hospitals for the poor. His hand gesture may indicate open-hearted generosity, while his bulky figure suggests worldly prosperity. The sculpture was presented to the Royal Society of Arts in 1793, where it remained until its acquisition by the Museum. Carlini was a native of Genoa, and subsequently worked in the Netherlands (The Hague from 1748 to about 1753) before arriving in Britain about 1760. He was a founding member of the Royal Academy, in 1768. 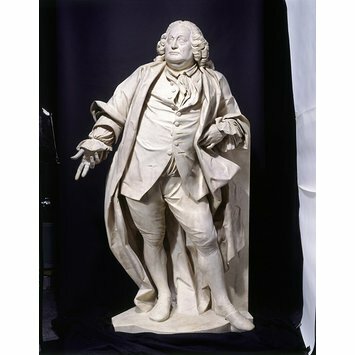 In Holland he had been employed as a decorative wood-carver; In England his work was largely in marble, and included funerary monuments, a bust of George III, ancd deorative heads for Somerset House. The life-size marble figure depicts Joshua Ward standing, resting on his right foot, his left leg extended, with the slippered foot slightly overstepping the marble base (a narrow support of marble beneath the foot has been left underneath). His left elbow leans on a plain block, while his right arm is outstretched. Ward's waistcoat, held by three buttons (with six buttons undone), strains across the cast torso, whilst his full-length great-coat is swathed about his figure, emphasising the swelling form of the whole. Details such as the wig, the lace cuffs and the cravat are broadly carved, rather than executed in fine. Presented to the Royal Society for the Encouragement of the Arts, Manufacturers and Commerce (the Royal Society of Arts) by Ralph Ward (the great-nephew of Joshua Ward, and one of his executors) in 1793. Purchased from the Royal Society of Arts with the assistance of funds from the Phillips Bequest in 1991 for £250,000. Carlini was a native of Genoa, but the circumstances of his early training are unknown. He worked in The Hague from 1748 to about 1753, is first recorded in London in 1760 and spent the rest of his working life in England. In Holland he had been employed as a decorative wood-carver; in England his work was largely in marble, and included monuments, a bust of George III, and decorative heads for Somerset House. The thumb and fingers of the right hand are modern resin replacements. The subject was a renowned quack-doctor, who manufactured, advertised and sold his patent medicines, known as "Ward's Drop and Pill". The present figure may have been intended as part of a monument to Ward to be erected in Westminster Abbey, but this plan was never brought to fruition, perhaps because the project was incomplete at Ward's death. A drawing showing how the statue might have been intended to be seen within a niche is in the British Museum (inv.no.1920-4-20-4). A bronze copy of the figure was made by the Morris Singer Foundry at Basingstoke shortly before it was acquired by the Museum. This is now housed at the Royal Society of Arts. Trusted, Marjorie, “A Man of Talent”, Agostino Carlini (c.1718-1790): Part I”, Burlington Magazine, CXXXIV, 1992, pp. 778-782, and fig. 15.